Hi everyone, Todays post is a little different as I have got a fabulous prize to give away to one lucky winner: A set of Lavish Blooms dies from Tattered Lace! All you’ve got to do to win is FOLLOW my blog and the Tattered Lace Challenge blog and I will enter you into the prize draw. PLEASE make sure there is a contact option on your blog profile – I will be forced to pick another winner if I am unable to email you directly and easily. Dies will be shipped directly from the supplier so please be aware that any shipping address you supply will be passed onto Diane Peternal. The winner will be picked at the end of April and notified at the beginning of May – I will publish the winner on the blog. Onto the card… I started by cutting out Spellbinders grand squares largest square ( 7×7″) then I made a frame using the dies that measure 6.5″x 6.5″ and 5″x5″, once the frame is cut I then use the square die that measures 5.5″x5.5″ to give an embossed design to the frame. Matt and layer squares onto cream card. Use backing paper of your choice for the centre and glue onto base layer, add mounting foam to the frame and attach to base square. Cut out 2 Tattered Lace oriental fans and concertina fold them, I then cut out 2 Tattered Lace large lilies , 1 small lily and a Tattered Lace stamen. I cut each petal of the lily to the centre, do this on all 3 flowers, using a moulding mat and ball tool, shape all 3 flowers then layer them up, roll the stamen and glue in the centre of flower, I then sprayed with crafter companion glue and sprinkled with glitter. I then cut out Spellbinders labels 20 (3rd largest die). 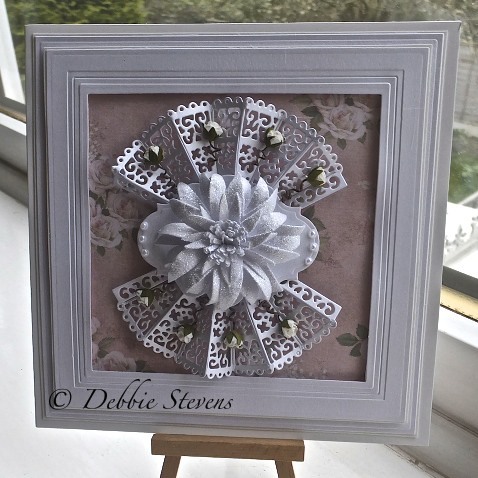 Glue the 2 fans to centre of card, then labels 20 then Tattered lace bloom and add any other embellishment you have. Finished card 7.5″x7.5″. Gorgeous card as usual. Have been over to the tattered lace blog, there are a few nice cards posted so far. good luck with the challenge. These dies make incredible looking flowers and as usual, you have created a wonderful card with them. Thank you for giving your Followers a chance to win such gorgeous dies too. Love your card – amazing again1 You are so generous with your give-aways and also thank you for sharing your cards with us.